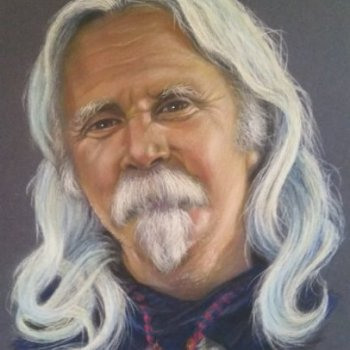 Artist Gary Lowe lives outside of Dawson Creek BC, and now specializes in graphite commissioned portraits and pastel commissioned portraits. Clients have had old photos of deceased family members and pets that they would like to remember. They have discovered that even the advanced digital camera techniques are weak compared to what a good graphite or pastel painting can do. I have done a great number of different subjects, from portraits, pets, to scenes in the mountains. Many times people wanted an oil painting of a particular area. With the use of their photos, I can put them into the same scenery painting. If you have a photo that you would like to be changed to a graphite or color pastel portrait or a scene in oil ,I will work closely with you. Send the photo(s) via email and allow a month for completion. See www.thecharlierussellartist for more details and prices. There is a 50% deposit but I will guarantee 100% satisfaction or your money back. Not many artists have this degree of confidence when it comes to commissioned work. It makes me happy that, at the completion of your painting, you will have something extra special and meaningful to you. This painting may be handed down from one generation to another because it is unique and personally valuable.